The architecture firm Farr Associates, the Chicago Architecture Foundation, and the US Green Building Council have produced a fantastic exhibit on how to create green neighborhoods. It opened in Chicago last year and is now on display at the American Institute of Architects headquarters in Washington. This carries some symbolism. When it comes to sustainable communities, the architecture profession has been both hero and villain. It has been a hero because many of the early (and continuing) leaders of smart growth and sustainability in our built environment have been architects, from William McDonough to Peter Calthorpe, from Andres Duany to David Dixon. Frankly, in my opinion architects were way ahead of the environmental community in forging solutions to sprawl. And it’s a good thing that they were, because they gave us environmentalists something positive to advocate. And yet, as an institution, the profession has always seemed a little uneasy about community issues, much more comfortable regarding individual buildings than their neighborhood contexts. 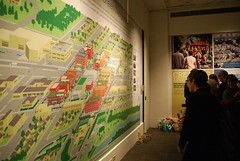 The AIA has a wonderful small staff in its Center for Communities by Design that does great work for sustainability. But its budget has shrunk, and its advisory committee (of which I was once a proud member) was unceremoniously disbanded some time ago by the organization’s management and board. I still don’t know exactly why; surely we weren’t that radical. AIA’s annual green awards are given to buildings that are sometimes (but, to be fair, not always) in startlingly un-green community contexts. Until recently, one could say much the same about even the US Green Building Council and LEED, its industry-leading green building rating system. One can still get the highest possible (platinum) green building rating even if the building in question is located in the middle of a remote cornfield, such that visitors emit far more carbon traveling to and from the building than it theoretically saves with internal green technology. The argument in favor of bestowing the honor is that the building was going to be put there in any case: why not make it as green as possible? Well, sure, but one could say the same about mountaintop removal mining. Should we really be giving prestigious awards for making it better when the only environmentally sound thing to do is to discontinue the practice altogether? For architecture at least, LEED for Neighborhood Development has changed the game. Created by USGBC, NRDC, and the Congress for the New Urbanism, LEED-ND evaluates both a development’s internal environmental performance and that of its context, resulting in a far more true green rating. I’ve written extensively about the system and needn’t repeat myself here. Suffice it to say that, while nothing is perfect, LEED-ND is a great start to defining what is smart about smart growth and what is green about true green development. But LEED-ND, its 56 technical prerequisites and credits, its 47-page “certification policy manual” and 400-page “reference guide” are not for those short on time and patience for hyper-precise measurement, or for planning and construction trivia. As good as the system is for technical evaluation, it is lousy as a public relations instrument. 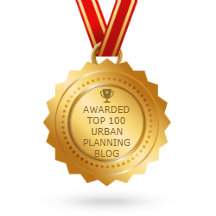 All sorts of responses have cropped up to address that shortcoming, to develop additional tools that use the basics if not all the details of LEED-ND to enhance public understanding of what makes for good, green neighborhood development. They include, for example, NRDC’s forthcomingCitizen’s Guide to LEED-ND and a slew of products developed by USGBC (such as this slideshow). But the best to reach the public so far isNeighborhoods Go Green!, the brainchild of architect and CNU board member Doug Farr. It was developed by Farr Associates in partnership with USGBC and the Chicago Architecture Foundation. Its run in Washington will extend through April 21, after which it will travel to additional (but currently unspecified) locations. 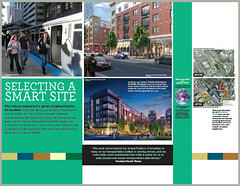 Selecting a Smart Site. Where are the best locations for new green neighborhoods? Learn why selecting a site near schools, commercial centers, and existing infrastructure such as public transit is critical to creating sustainable communities. Creating Lively Places. How do we design vibrant neighborhoods? Discover how a compact, walkable layout and a mix of shops and housing make lively places. Integrating Buildings and Infrastructure. How can buildings and infrastructure work together to reduce waste and save energy? See how innovative water management and energy conservation strategies create greater sustainability than green buildings can achieve alone. Rating the Neighborhood. How are green neighborhoods certified? Learn more about the LEED for Neighborhood Development rating system designed by the U.S. Green Building Council and its partners. 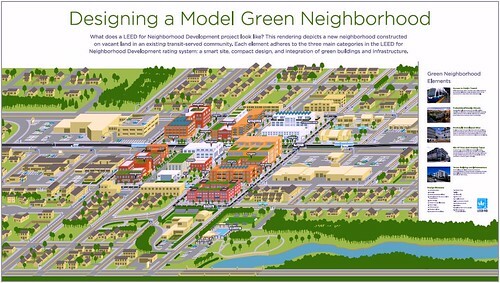 Designing a Model Green Neighborhood. What does a green community look like? Explore a detailed rendering of a model neighborhood that incorporates sustainable design practices. In Chicago, the sponsors of Neighborhoods Go Green! also featured a local “challenge” to developers and civic leaders to bring at least one LEED-ND-certified project to each municipality in the Chicago region and each county in the state of Illinois. Here in the DC region, we already have the most certified LEED-ND projects of any metro area in the country. Ten projects from the District of Columbia, more than any other city, participated in the pilot phase of the program. 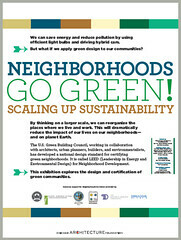 The DC version ofNeighborhoods Go Green! features a number of projects in the region, including City Center DC downtown, The Yards on the Potomac River waterfront, and Twinbrook Station in the DC suburb of Rockville, Maryland. 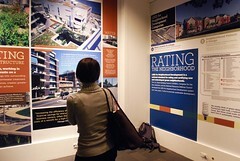 On Monday, April 4, several organizations – including the local chapters of USGBC and the American Planning Association, AIA’s Committee on the Environment, and the national USGBC – will host a symposium in conjunction with the exhibit, featuring expert discussion of several LEED-ND projects and the implications of growing as sustainably as possible in the economically robust DC region. Kaid Benfield writes (almost) daily about community, development, and the environment. For more posts, see his blog’s home page. Director, Sustainable Communities and Smart Growth, NRDC; co-founder, LEED for Neighborhood Development rating system; co-founder, Smart Growth America coalition; author, Once There Were Greenfields (NRDC 1999), Solving Sprawl (Island Press 2001), Smart Growth In a Changing World (APA Planners Press 2007), Green Community (APA Planners Press 2009); voted one of the “top urban thinkers” in 2009 poll on Planetizen.com and named one of “the most influential people in sustainable planning and development” in 2010 by the Partnership for Sustainable Communities. Attorney, recovering litigator, cyclist, blogger, dreamer.